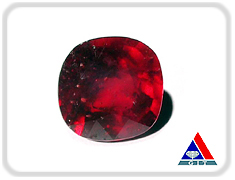 In August 2007, the Gem Testing Laboratory of Gem and Jewelry Institute of Thailand (GIT-GTL) received one unusual lead-glass treated ruby we ever found. This 9.07 ct ruby (Figure 1) shows a mosaic-like surface feature apparently comprising ruby fragments cemented by lead-glass matrix (see Figure 2, under dark field illumination). It is better seen under reflected light (Figure 3) in which the ruby appears light grey while the lead-glass is dark grey as a result of differences in lustres and hardnesses. Obviously the surface texture of the stone displays somewhat unmatched pieces and, in part, optically uneven orientation of many fragments. These textural features seem to suggest that this ruby is rather a composite stone than a single crystal fracture-filled with the lead glass as commonly found in many glass-filled rubies. The basic gemological properties of this stone are similar to those of common ruby except its specific gravity (SG) which is about 4.20. This value is somewhat higher than the normal range of corundum (~ 4.00), and is certainly due to the influence of very high amount of lead-glass in the stone. 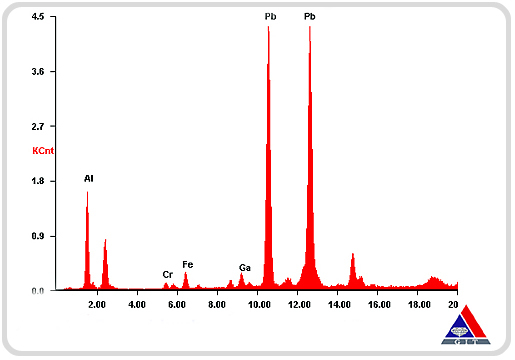 The qualitatively chemical analysis using EDXRF also reveals a pronounced lead (Pb) content (Figure 4). 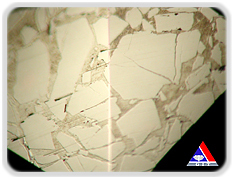 The FTIR Spectrum of this stone shows two exceptionally strong broad absorption bands in the range between 2,200 – 3,800 cm-1. 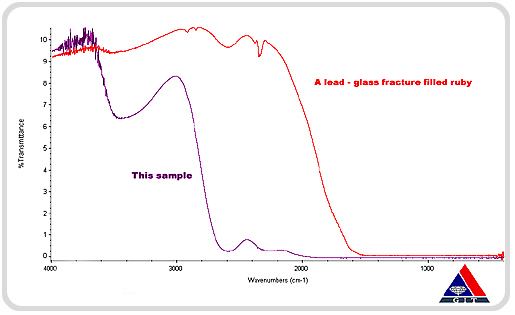 Such the absorption bands, nonetheless, are comparable to those of the artificial glasses detected in the glass-filled ruby (Figure 5). 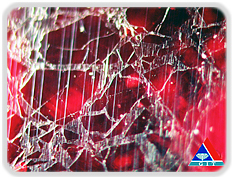 "A composite made up of ruby and (lead) glass". So for the GITGTL has not received any stone with such as similar feature again.This may due to the uncommon nature of this type of stone in the market or they might have been sold at a reasonably low price without certification.